It's been a couple of weeks now, but we've got another cute simple tutorial for you to try out on the Chictopia Blog. I'm sure you've heard the buzz about the trendy peplum silhouette! Well, I've been a fan for a while now because of how it takes in my waist & gives me a hippier silhouette. 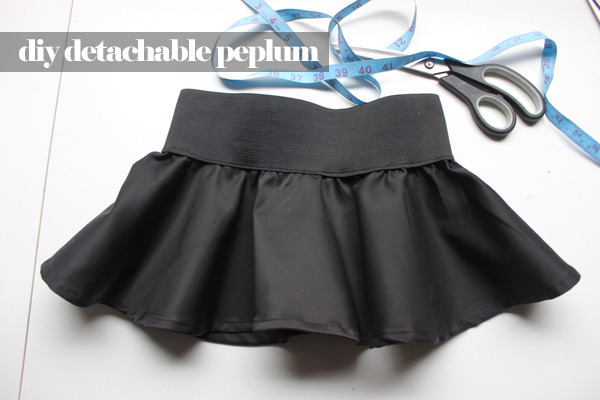 Check out the article we posted on Chictopia to learn how to make your own detachable peplum that you can wear with any outfit. Click on any of the pics to go read the full diy! We haven't been posting many manicures lately, but hopefully with Spring here, we'll think up lots more cute techniques with all those bright colours we're starting to see this season! Today we're gonna do a really simple technique that you can do with only a couple colours & any dotting tool you have laying around! Use your nail polish brush to fill in the remaining gap! 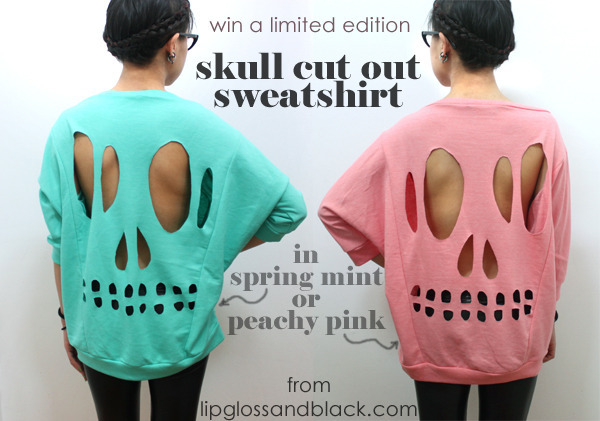 Thank you all SO much for taking your time to enter our giveaway for the skull cutout sweatshirt! It means so much to us that a couple hundred people took the time to complete a survey for our project & we look forward to what the answers tell us about ourselves & our company! As usual, we always assign all entries to numbers and then use a random number generator to select our winners fairly. The winner of this giveaway was Brittany M! We'll be contacting you via email soon to get your shipping address! CONGRATULATIONS! When we made it to the theatre, there were dudes dressed in all-black, wearing hunger games toques & waving massive mockingjay flags at all corners of the street. The lineup for people with passes was around the corner of the building, but that put us in the perfect position to watch the crowd in front of MuchMusic building. The boys from the movie were there as promised! L-R Alex Ludwig (Cato), Josh Hutcherson (Peeta) and Liam Hemsworth (Gale). As we made it back to the front of the building, we spotted these cute themed signs along the barricades. k, these dudes don't really care what you do in this district because kids were all up in our faces yelling at us. "YOU GUYS ARE ADULTS, GIVE YOUR TICKETS TO THE CHILDREN!" Our cameras & phones were all taken away when we went into the theatres, so I have no pics of the red carpet or of the actors when they came in to speak to us. But we have our two points of view of the film, with myself as a reader of the series & Sam as a non-reader. After my friend Amanda recommended that I read this series, I was addicted & finished the books all within a week. The Hunger Games is the story of a post-American Society where children are picked from a lottery to fight to the death for the entertainment of the Capitol. As a book written for young adults, it's an easy read but also teaches a lesson about this dystopic society and reflects on society's desensitization when it comes to the content of reality tv. I thought the movie was great. I loved the way the characters and the districts were brought to life. The scenes were beautiful, the costumes were awesome & I really liked the casting. In terms of the storyline though, I felt like a lot of details were skimmed over or re-written in ways to keep the film short & rated PG. I think it will be hard to keep loyal readers happy, but all the main characters are sure to be HUGE stars after this movie. Samantha had a lot of questions for me after the movie-- as a non-reader she found that there were certain things that weren't explained entirely or certain details that left holes. I ended up having to explain more details of what the movie was trying to convey by explaining parts of the book to her. Still, I thought it was entertaining and.... I definitely cried during a couple parts. ha! We need a favour guys! We're working on a project right now to improve both our company and our blog! As a two-girl operation, it's been tough to figure out where we should be focusing our time & we have a group of students right now that are helping us with that. If you're curious, I've posted details about that here In order to make progress though, we have a short survey so that we can find out more about our customers and readers. Of course, we're not just gonna make you do a survey for nothing! If you fill it out, you get the chance to win one of our Limited Edition Skull Cut Out Sweatshirts! It's not even up in the shop yet, but is valued at $55 and comes in Spring Mint & Peachy Pink. It's a dolman style sweatshirt with a relaxed fit & on oversized collar. It's the perfect addition of colour to your spring wardrobe & looks great worn alone or over an awesome collared button-up :) Read the details below for your chance to win! ♥ you MUST complete the mandatory entry above first! ♥ the winner will be selected using a random number generator and contacted on March 25th via email. ♥ prize is not redeemable for cash value and cannot be returned or exchanged for store credit. ♥ you MUST complete the survey first, or your extra entries will not count. ♥ your email or twitter handle that you enter in the survey will NOT be collected and used for any purposes other than contacting the winner. To start, I wanted to tell you about one specific project we've been working on. A group of students from McMaster University (my alma mater!) asked if they could focus on our business for a Master's level entrepreneurship project. We completed a quick interview over email & then they asked us if we would like to go into their class to speak about our unique business! We were so flattered but were a bit nervous about speaking to an MBA level class about business. We lack a background in business and aren't great public speakers either but after speaking on the phone with Dr. Honig, we felt much more comfortable. He reassured us that entrepreneurs are so accustomed to talking about themselves and their companies that we would surely be able to speak to the class for a full hour. Plus, we received two lovely leather folders as a commemorative gift. Thank you Dr. Honig! Currently, the students are working with us to give us some form of a business consultation & recently came to our studio for a meeting, armed with a half dozen cupcakes for us! I just wanted to give you guys a quick primer on what we're doing right now because I'll be asking for a bit of help in our next post! In return for the favour though, we're already doing another giveaway so keep an eye out! Thank you all so much for always reading & commenting! BEST NEWS EVER YOU GUYS. ♥ passes do not guarantee admission so come EARLY! The theatre is overbooked to ensure capacity and seating is on a first come, first seated basis. ♥ the winners will be selected using a random number generator and contacted on March 19th via email. ♥ your "pair of passes" will be distributed to you as a link and PIN code for your e-tickets via email. Your emails will not be saved or used for any other purpose. ♥ prizes are not redeemable for cash value and cannot be returned or exchanged for any other passes or prizes. ♥ don't spam us with comments! you'll be disqualified for reposting your links. ♥ don't post any spoilers in case anyone hasn't read all the books yet! c'mon guys! 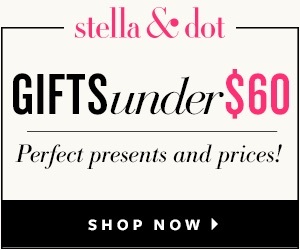 We're working with Chictopia on another awesome campaign! 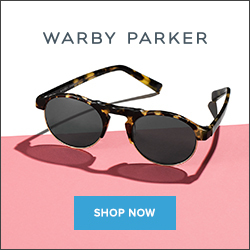 Get all the hottest spring looks from Chictopia Shop now at 20% off! We're hand picking items from L&B to list on the shop from today until March 30th & only ONE of each will be available at that special price! It's been a while but we're still blogging over at Chictopia's Everybody is Ugly blog! Today we just put up a tutorial for getting the "gorilla arm" look! Yes, it's a ridiculous name for the trend but it's SO cozy for those last few weeks of winter. Plus it'll surely work out amazingly when you wear your coat draped on your shoulders for that too-busy-to-put-my-arms-in look! :) Check out the how to by clicking on the photo below! and in case you missed it, here are the links to all the articles we wrote for Chictopia when they sent us to Mercedes-Benz Fashion Week!